25 years ago tonight, the Isabella Stewart Gardner Museum suffered a devastating loss to its collection. 13 works of art led to a FBI investigation, and a new Federal Criminal provision. But the works themselves are still lost. Today brings a slew of examinations of the theft and the subsequent investigation. Miracle of harmony and light indeed. The FBI and U.S. Attorney’s office are are offering unconditional immunity to anyone who helps locate any of the 13 stolen works of art from the Gardner heist. Anyone with information regarding the Gardner Museum theft should contact the Boston FBI office at 1-617-742-5533. The night before after St. Patrick’s day, early on March 18, 1990, thieves stole 13 works from the Gardner Museum. The lost works by Degas (including La Sortie de Pesage pictured here), Rembrandt, Vermeer, and Manet were stolen and some were cut from their frames, but were also stolen from the thousands of visitors who have visited the Gardner Museum in these twenty years. The FBI and U.S. Attorney’s office are re-publicizing their offer of unconditional immunity to anyone who helps locate any of the 13 stolen works of art from the Gardner heist. Anyone with information regarding the Gardner Museum theft should contact the Boston FBI office at 1-617-742-5533. Charles Hill, a former Scotland Yard detective, says art thieves are not that smart and do not deserve the glamour they receive from heists. One of the least interesting items stolen in the infamous Gardner heist could turn over valuable clues. Pictured here is The Concert, by Vermeer perhaps the most valuable and important of the stolen works. Is a resolution eminent in the largest art theft in history? 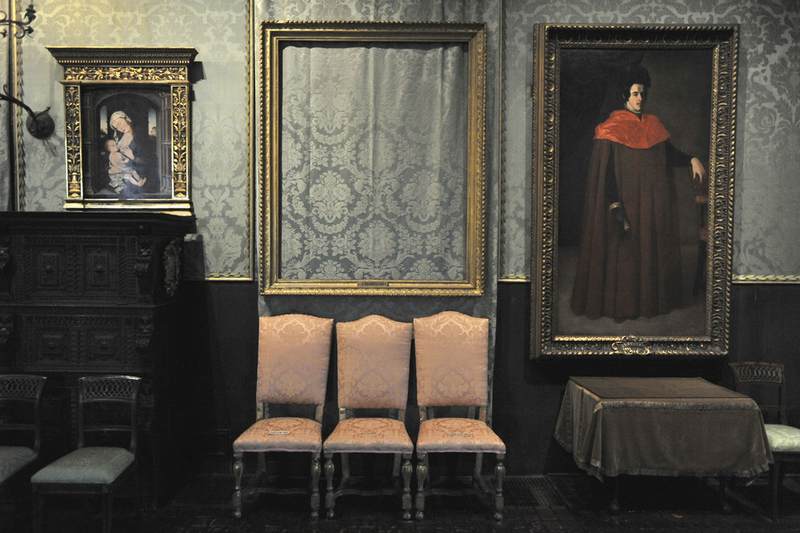 Perhaps, with word this morning that a Boston grand jury is scheduled to hear evidence this week into the 1990 theft from the Isabella Stewart Gardner Museum, estimated at between $300-500 million. 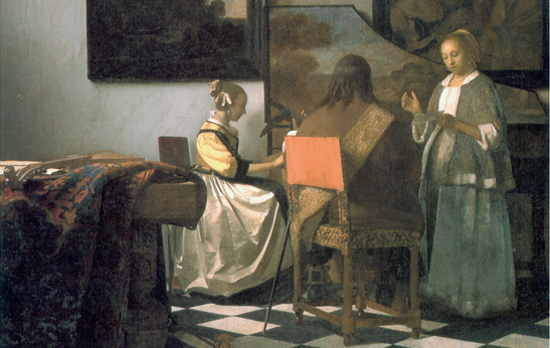 One of the stolen works is the Concert by Vermeer. Stephen Kurkjian of the Boston Globe has the story, in which he was given details of a subpoena from a former museum employee who worked there at the time. The former worker said two FBI agents questioned him about his recollection of the theft several days ago and handed him a subpoena to testify before the grand jury in Boston tomorrow. The agents told him they were gathering facts on the case and were hoping that the grand jury would “shake things up” in the long-stalled investigation, said the former worker, who asked not to be identified. The agents did say that they were pursuing the possibility that the theft may have been carried out by three individuals – and not two as has long been publicly believed, the former employee said. On Friday, a spokeswoman for US Attorney Michael J. Sullivan’s office declined to comment on the grand jury, stating that the office never confirms or denies the existence of such a session. A spokeswoman for the Gardner Museum also declined comment. The former museum employee read portions of the subpoena to the Globe and said it was signed by Brian T. Kelly, a veteran prosecutor in the US attorney’s office. Kelly has helped spearhead the federal investigation into and the crackdown of James “Whitey” Bulger’s criminal enterprise. It is often said that a grand jury is both a sword and a shield. It protects the rights of criminal defendants, but also allows prosecutors to use their subpoena power to compel testimony. Whether a resolution will emerge remains to be seen, but right now there are more questions than answers, most notably: where are the paintings? Author Derek FinchamPosted on December 17, 2007 Categories UncategorizedTags Art Theft, FBI, FBI Art Crime Team, Isabella Stuart Gardner Museum, VermeerLeave a comment on Stewart Gardner Resolution? Will Billboards help Return $300 Million in Stolen Art? Over the weekend, the Boston Globe picks up a piece by London’s Financial Times, that Eric Ives, head of the FBI’s major theft unit, is considering using billboards to aid its investigation of the works stolen from the Isabella Stewart Gardner Museum in Boston in 1990. 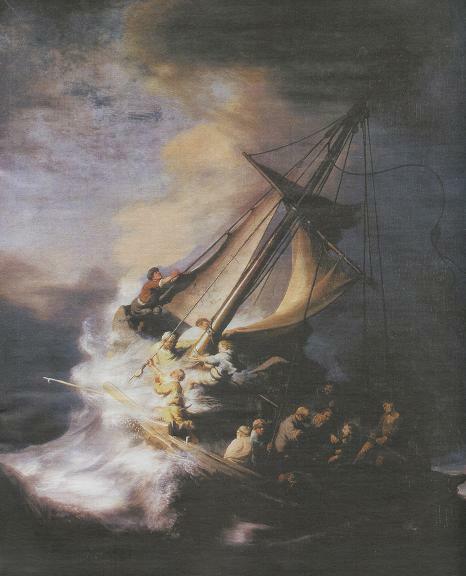 One of the works stolen includes this work, which is Rembrandt’s only seascape. The total value of all of the works has been estimated at $300 million. I’ve written about this theft before, in terms of a new documentary here. The best account of the theft I’ve found is Court TV’s here. Will Billboard’s work? I’m not sure. They certainly can’t hurt. The idea, I suppose, is for someone to catch a glimpse of these works and after seeing the billboard, alert the authorities. I’m not sure there would be much of a market for these works, as they are so widely known in the art world, that there would certainly be an impossibility of a good faith purchase. The law would not honor the sale because the buyers should know that these works have been stolen. Fascinating theories abound, involving Boston Mafia and IRA members. Certainly, no one will be able to sell these works on any licit market, and if the thieves are caught, there may be a prosecution under the National Stolen Property Act if the transaction has a federal character (like crossing state lines for example). At this point, nearly 16 years after the theft, there does not seem to be any leads for the FBI Investigation, and a billboard campaign may serve to renew interest in the theft. Author Derek FinchamPosted on November 7, 2006 Categories UncategorizedTags Art Theft, FBI, Isabella Stuart Gardner Museum, Rembrandt, Stolen ArtLeave a comment on Will Billboards help Return $300 Million in Stolen Art?